Pet Fence of Middle Tennessee was formerly Pet Safe of Middle Tennessee. Our company has grown into one of the most well respected pet containment companies in Tennessee. We install PetSafe brand products that come with lifetime warranties. As the leading selling brand, PetSafe continues to improve upon already outstanding products with unequivocally high research and development expenditures. 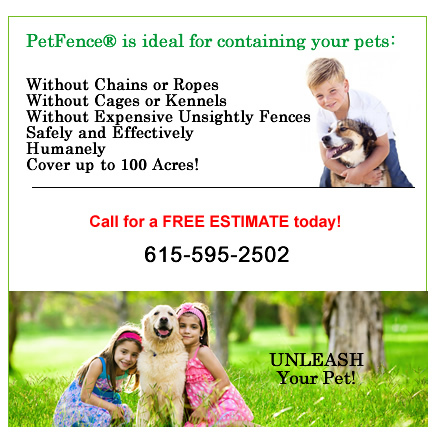 Happy to install and service these products professionally and confidently, Pet Fence of Middle Tennessee is containing more than one thousand dogs in Middle Tennessee. From five pound puppies to 200 pound Mastiff giants, Pet Fence of Middle Tennessee is a truly accomplished installer and trainer. So, for any of your underground or hidden pet containment needs, choose Pet Fence of Middle Tennessee!